This mechanical horse is our patent right,it can run without battery,Children like it very much,it is very popular in China.We have exported to Japan,Korea ,Singapore and so on.It is very promising. 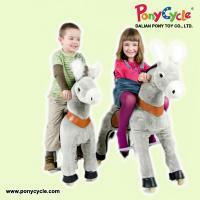 DALIAN PONY TOY CO. LTD is the original inventor of PonyCycle brand ride on toy, and the owner of brand- PonyCycle. We focus on R&D, production and sales PonyCycle brand ride on toys and ride on amusement equipment. The company since its inception in 2003 has been the experience of nearly 10 years of R & D and manufacture of such products. After going on for years and continue to improve and update products, we now have a mature technology, product performance is very stable. The same time, we have developed an effective quality control system and perfect after-sales service system, the strict implementation of international toy safety standards, our products have passed the European EN-71, CE, AZO U.S. ASTM-963 and other international safety standards. We always give you high-quality branded products and are proud of. We always deliver golden quality and service. Our market has covered dozens of countries in Europe, the Americas, Asia, Australia, Africa, the Middle East and other customers worldwide. We are actively recruiting distributors around the world, and establish long-term and stable relationship with the clients. We’d like to sustained grow up and develop with clients together in order to achieve a win-win.